Christian Friends of Israel UK have arranged a tour of Israel to run from 28th May to 3rd June 2019, visiting a variety of places in the Galilee region, the Golan area, Jerusalem and also Bethlehem. 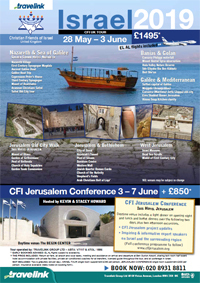 An extension option from 3rd to 7th June covers the CFI Jerusalem Conference which is planned to feature a variety of speakers and updates on the various aid projects undertaken. Click on the image below the read the brochure and application form.